We need your help! Just before the current administration leaves power, it may change the rules so natural-gas companies can drill twice the number of wells in the same space in New Mexico. Hilcorp has an application before the New Mexico Oil Conservation Commission asking to double the allowable well-density in the Blanco-Mesaverde gas pool across San Juan and Rio Arriba Counties. Under current rules, operators can drill 8 wells per 640 acres and Hilcorp is asking to drill 16 wells per 640-acre section. That’s bad news for the air quality of 13,000 children and adults in San Juan County who already struggle with asthma. 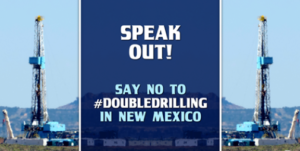 Attend the New Mexico Oil Conservation Commission Hearing at 9 a.m. Monday, Nov. 19 at Porter Hall, 1st floor, Wendell Chino Building, 1220 S. St. Francis Drive, Santa Fe, to speak out against this proposal. Share this campaign and invite friends to the Facebookk Event. Under current rules, operators can drill eight wells per 640 acres of land. If Hilcorp is granted its exemption, up to 8,000 new wells will be drilled in San Juan and Rio Arriba counties in northwest New Mexico. In addition, the public will no longer have the opportunity to comment on well-density issues in the Blanco-Mesaverde gas pool. Hilcorp’s proposal would circumvent the need to analyze the impacts of more oil and gas development on public health, water resources, air quality, and the environment. Thank you for your continued activism! This is a letter campaign on the Doubledown of Fracking wells per site. Please write a letter, it only takes a couple of minutes and you have helped.